I attended an event last night titled "65/54 Brown v. Chicago: Race and Access in Education" which was held at the Hull House Museum near UIC in Chicago. The map below was shared by one of the speakers, Niketa Brar, a co-founder and executive director of Chicago United for Equity (CUE). The event description says "Sixty-four years after Brown v. Board of Education (1954) declared that separate was unequal, Chicago’s public schools remain segregated, and access to education continues to be out of reach." Panel members were passionate and full of data to support this claim and urged that anyone who cares, should take an active role. The map on the CUE web site helps support this. It is one of the few maps I've found that show CPS school boundaries. You can zoom in to enlarge the maps. 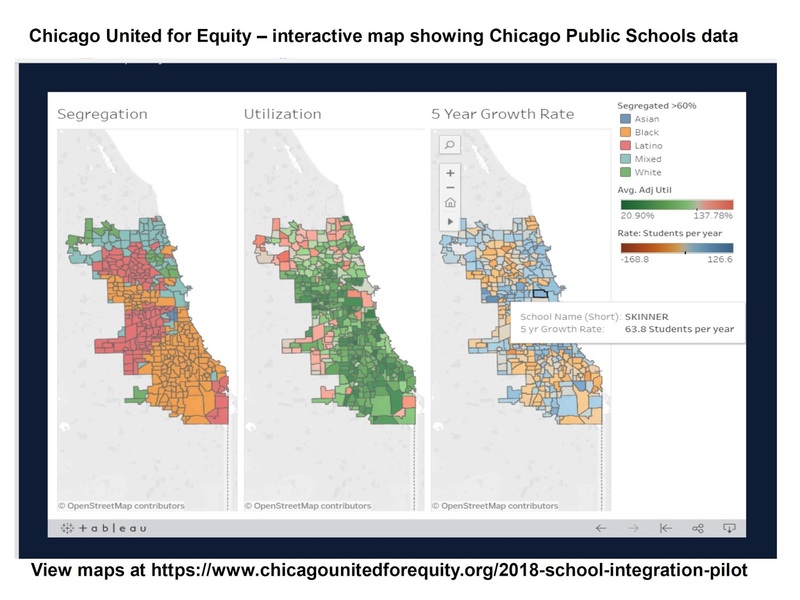 You can also run your mouse over the map and find data for each school, showing segregation rates, student gains and/or loss over past few years, and school utilization by community members. Other speakers were Amanda Lewis, Director of the Institute for Research on Race and Public Policy and Professor of African American Studies and Sociology at UIC and David Stovall, a Professor of Education Policy Studies and African American Studies at UIC. I met Dave last year and continue to encourage him to put his research on a blog or web site. The moderator was Cassandra McKay-Jackson, an associate professor, and the new director of the Master of Social Work program at Erikson Institute. Last night's session was recorded and once the video is available I will add it as a link to this article. Listening to the speakers is much more effective than me trying to paraphrase what they were saying. As you look at the CUE map, look at map stories on this blog and on the Tutor/Mentor blog. I feel that students, parents, volunteers and others could be using map platforms like the CUE site to tell stories, specific to areas as small as a city block or a CPS school neighborhood. Every time something happens that shows the inequity in the city, a story needs to be created. Every time something good happens, stories can be created. This needs to be happening daily if we're going to get more people involved and build the political power needed to address the deeply implanted root causes of these problems. Do you value what I write about and the information I share. Visit this page and use the PayPal to send me a small contribution to help me continue this work. 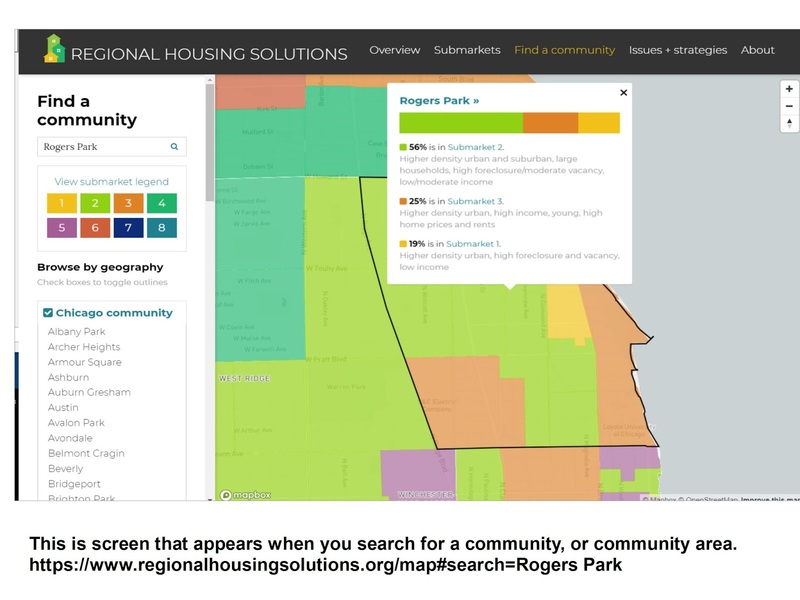 This week's presentation at ChiHackNight described a planning tool developed by the Chicago Regional Planning Agency for Planning (CMAP). Take a look at the video, then look at the screen shots I've posted below. Enter a community name, or Chicago community area name in the search bar on the middle of the page. I entered Rogers Park, on the far North side of Chicago. This is a screen shot of that results. In the video Elizabeth looks at a different community. You can compare the two, or search for other communities. Note the two rows of colored boxes to the left of the map. These are the eight issue areas CMAP data focuses on. The map is color-coded for these issues. 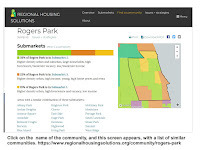 Click on the name ROGERS PARK in the pop-up box on the map above, and you get a screen shot that I show at the right. 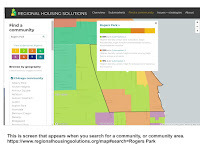 This provides an overview of what housing issues face Rogers Park. 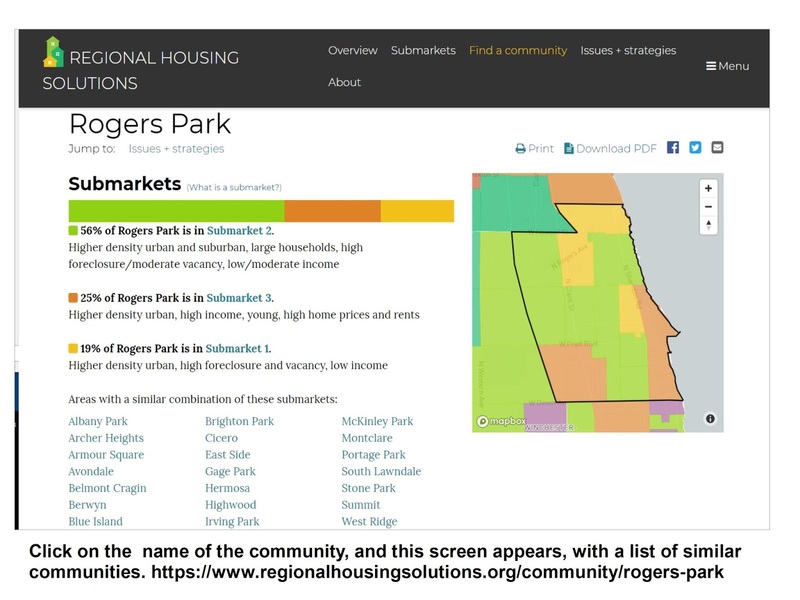 This view also shows a list of other communities in the region, including community areas of Chicago, which profile the same way. Each of these communities could be a resource for all others. If you scroll down on this page you come to a list of the eight issues. Click on any one of them and this type of screen opens, with a discussion of that issue and some suggestions of possible solutions. I don't know if this section focuses on the specific community area in my search, e.g. Rogers Park, but as I find out, I'll update this post. 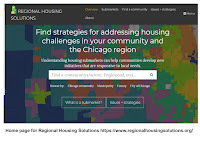 This is a robust and creative tool and people in every community of the Chicago region (and other places) should spend time getting to know its features. Also watch for updates showing how people are using this and how CMAP is adding new features to enhance its use. Why is this important to Tutor/Mentor Institute, LLC? I've been trying since 1993 to create a map platform that would support policy makers in similar ways that the CMAP platform is doing. 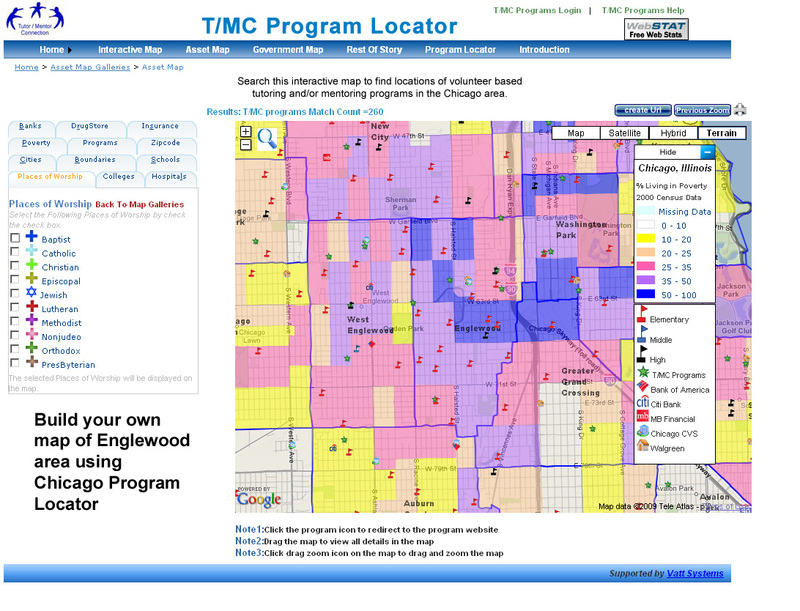 At the right is a map view created by the Chicago Tutor/Mentor Program Locator. So far the CMAP platform does not include poverty overlays, or other indicators such as poorly performing school, concentrations of ex-offenders, health disparities, violence, etc. It also does not include overlays of service providers and assets. It may in the future. Browse this site to see maps I've created using the Program Locator, and other maps created using ARC GIS. Browse this section of the Tutor/Mentor blog, to see more map-views created using the Program Locator. 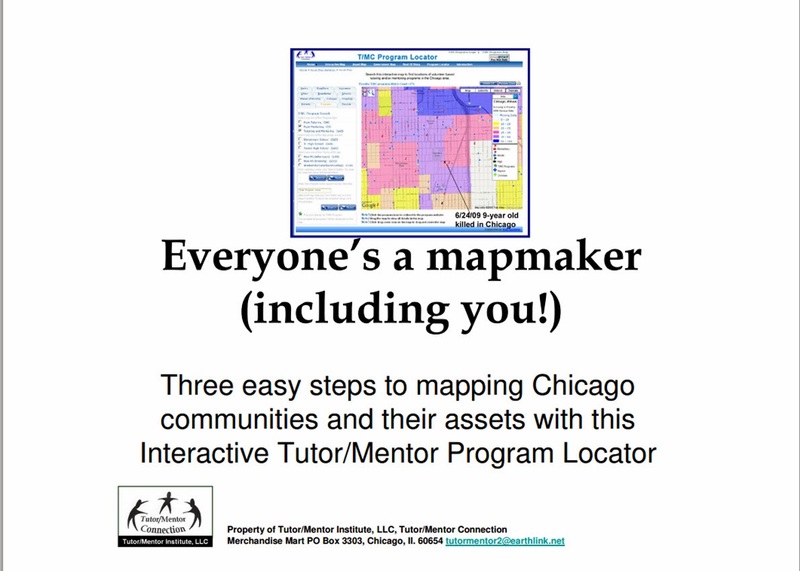 Here's a pdf created to show how the Tutor/Mentor Program locator can be used to make your own maps. And, here's a wiki page where I show the goal of using maps, starting in 1993. 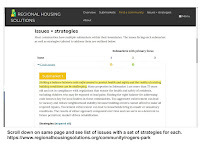 While I'm looking for partners who would help update the Program Locator that was built for me in 2008-09, I also point to other data indicator platforms, that people can use to create map stories that focus attention and resources on areas with high poverty. 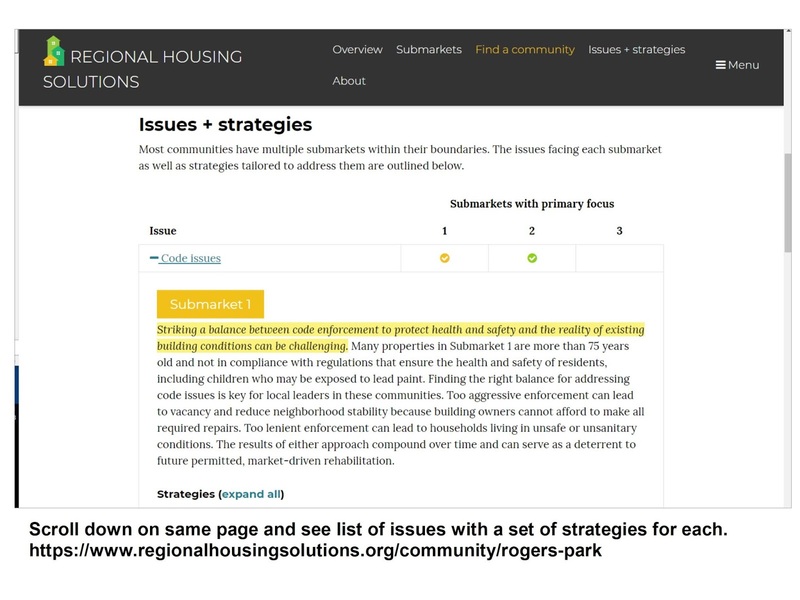 As you look at the features in the CMAP platform, and how they support discussions of housing issues, imagine a parallel platform supporting how communities discuss the needs of kids and the steps that would lead to better schools and a better non-school support system helping kids to careers. I can be reached on these social media platforms or you can introduce yourself with a comment on this blog. In January 2018 I posted an article, showing a Better Government Association (BGA) story about police shootings in Cook County, Illinois. The map at the left is from another story, that focuses on the number of school districts in Illinois. Take a look at the story, and the maps. 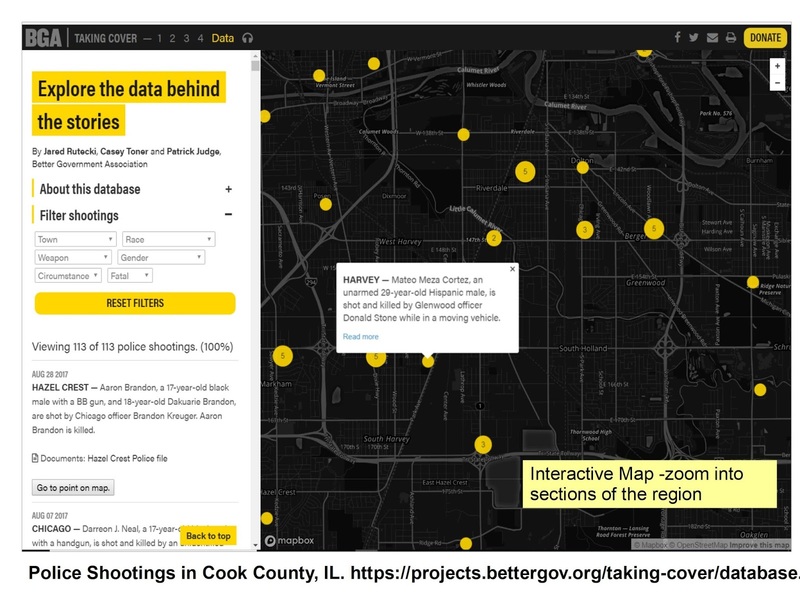 The Better Government Association and WBEZ have been following police shootings in Cook County suburbs and reporting this in a TakingCover series of articles. Their focus is on "How Cops Escape Discipline For Shootings in Suburban Illinois." One data resource is an interactive map that shows locations of shootings and provides details. The screen shot at the left was created by zooming into one part of the map then clicking on one of the yellow dots. In this case, I'm looking at the South Suburban area around Harvey, IL. While I'm interested in this topic, I'm more interested in helping people in communities with high poverty, poorly performing schools, too few jobs, and too much violence and police shootings, have a system of youth and family support services that help shrink the negatives by creating more paths to high school graduation, jobs and careers. More specifically, I've been trying to help well organized, mentor-rich, non-school tutor, mentor and learning programs grow in high poverty areas. Site based programs could be operating in faith based buildings, colleges, business sites and/or free standing locations. They could be hosted at public or private schools. I led one of these from 1975 to 2011, serving youth in the Cabrini-Green area of Chicago. For this to happen, someone needs to take the lead, then begin mobilizing others, who will help start and sustain needed programs. Using maps in stories that are presented via social media, YouTube, face-to-face presentations, etc. is one strategy to help do this. I've been piloting this for 24 years and keep trying to motivate others to adopt the same tactics. 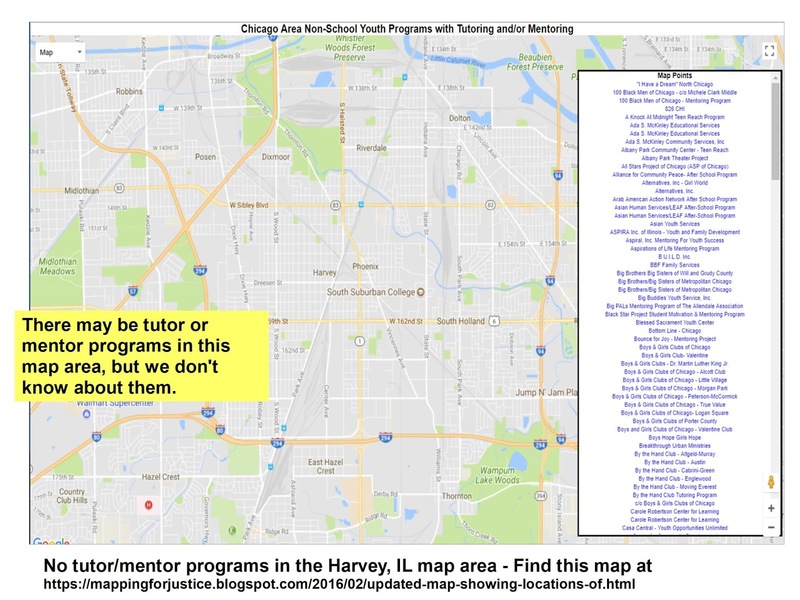 I created the Tutor/Mentor Connection in 1993 to help non-school, tutor, mentor and learning programs grow in the Chicago region and started a survey in 1994 to locate existing non-school tutor/mentor programs in the Chicago region. I've been plotting this information on maps and sharing it via an Interactive Program Locator, a web list, and the map shown at this link. Since 1994 I've been using the database and maps to tell stories and generate public interest and involvement aimed at drawing needed resources to existing programs, or helping new programs form where more are needed. At the left is a map view created by zooming into my map platform, to show the same area as the BetterGov.org map. In this case, I don't find any organized volunteer-based tutor or mentor programs in the area. That means people in this area are going to need to step forward and create programs, hopefully borrowing from the ideas on my web sites. Here's a section focused on "how to start a program". Lack of programs in the South Suburbs is not new information to me. In 2007 I hosted a Tutor/Mentor Conference in this area and this article show our goal of mobilizing people to help programs grow. At the right is a map-story created in the 1990s before I had access to the Internet for sharing these stories. Click on the image to enlarge. 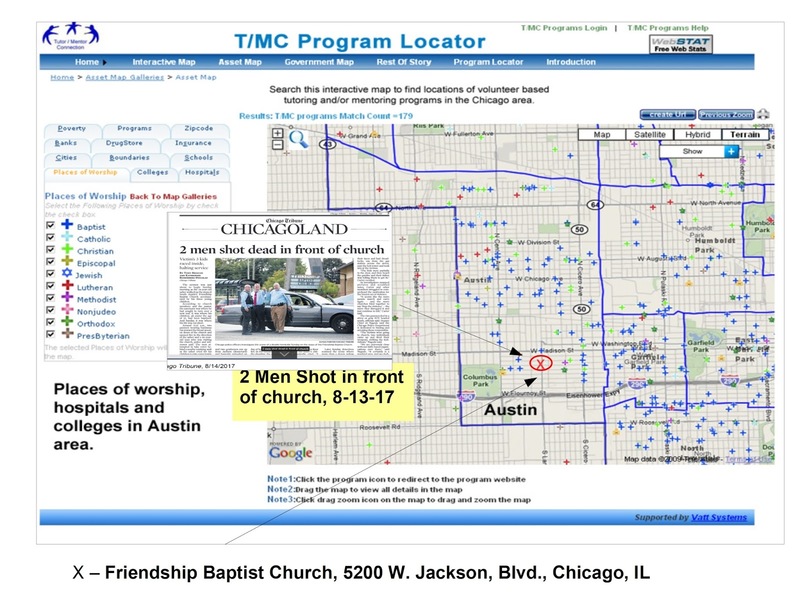 Then you can see a Chicago SunTimes story of a shooting in Chicago and a map that shows where the shooting took place. You can also see a table showing existing tutor/mentor programs in the area, with additional tables showing some businesses in the same area. Finally there's a narrative that ends up calling on assets, political leaders, media and others to help support existing programs in the map area, or help new programs form. I've been repeating this type of map-story for many years, but my voice is too small, and I'm an outsider in these neighborhoods. If youth, volunteers, parents and community leaders learn to create these stories, and share them weekly, they can begin to draw together a coalition of people who will take the lead on building and sustaining needed programs. 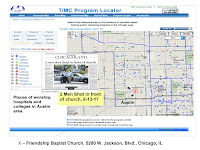 In 2008 the T/MC began building an interactive Tutor/Mentor Program Locator, with layers of information that could be used to create a story showing why help was needed, what tutor/mentor programs were in the area, if any, and what banks, hospitals, colleges, faith groups, etc were also in the area and should be taking a role to help build and sustain great programs. This link points to a presentation showing "how to use" the program locator to create map stories. 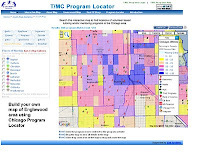 Since mid 2011 the T/MC has been operated by the Tutor/Mentor Institute, LLC and I've not had the resources to continue updating the Program Locator platform. Thus, it's out of date. 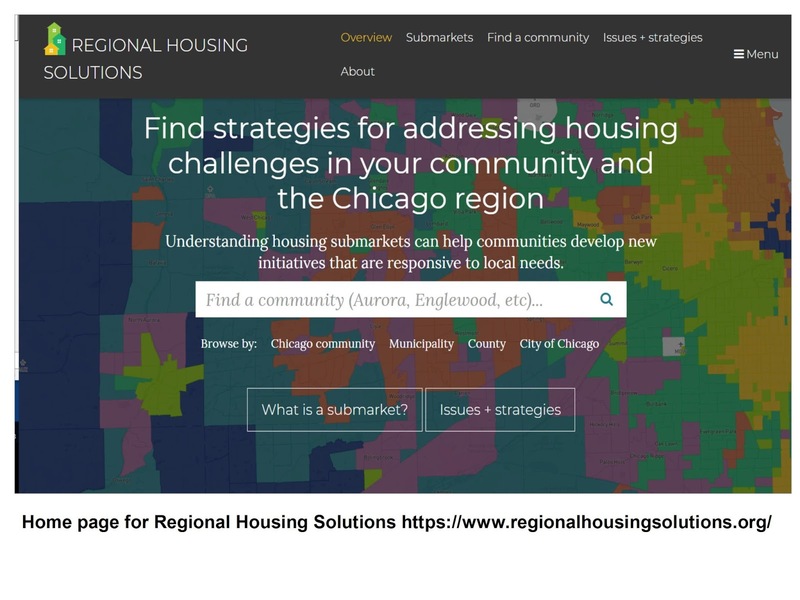 However, it's a model for what could be created in Chicago or other cities, and how it could be used to create map stories that draw attention and resources to neighborhoods where bad things happen too often. 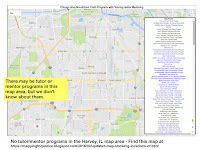 Furthermore, I've demonstrated on this blog, and many others on this site, that you can use data platforms created by others, such as the BGA and WBEZ to create map views which you then edit using Power Point or other tools to add additional information that shows why people should be helping tutor/mentor programs grow in this map-area. While there are many examples of map-stories on this blog, here's a Nov. 2017 article that shows how one person is creating map stories and sharing them regularly on Twitter. Others can, and should, do the same. If I begin to see more map-stories in Tweets and Facebook posts that focus on helping build needed youth and family support programs in different parts of Chicago, the US or the world, I'll know that some people have read this story, or forwarded it to others. Thank you to Joel Inwood of the ChiHackNight group for bringing the BetterGov.org map to my attention.